This is a popular end unit. Make your plans early to get away from the snow, cold, rain, etc. and enjoy southern Arizona this coming winter, spring, autumn, and even summer. Enjoy the beautiful Sonoran Desert, warm sunshine and all the activities of Green Valley, Tucson, Tubac, and surrounding areas. Views of the Santa Rita mountains from the back deck. Centrally located in the heart of Green Valley, near the mall, restaurants, churches, & Walgreen's. GVR pool within walking distance with optional GVR membership. Our townhouse is fully equipped for your convenience including a kitchen for all your cooking needs with Keurig coffee maker, a gas BBQ, and washer/dryer. King size premium mattress in master bedroom with private bath. King bed in 2nd bedroom. TVs in living room and main bedroom. Newer Kohler "comfort height" toilets in both baths. Discount for multi-month stays (2 month minimum). One person in the party must be 55 years of age or older. We chose this site because of the mountain view, the central location, GVR pool on-site, and the distance away from main streets. There is lots to do in and around Green Valley. We try to visit something new during each of our short visits. May be added at renter's expense. Enjoy views of the Santa Rita Mountains from our rear patio. With GVR card in another GVR site. One resident must be 55. Available within the Casa Paloma II complex with optional GVR fee, as well as at the GVR sites within Green Valley. 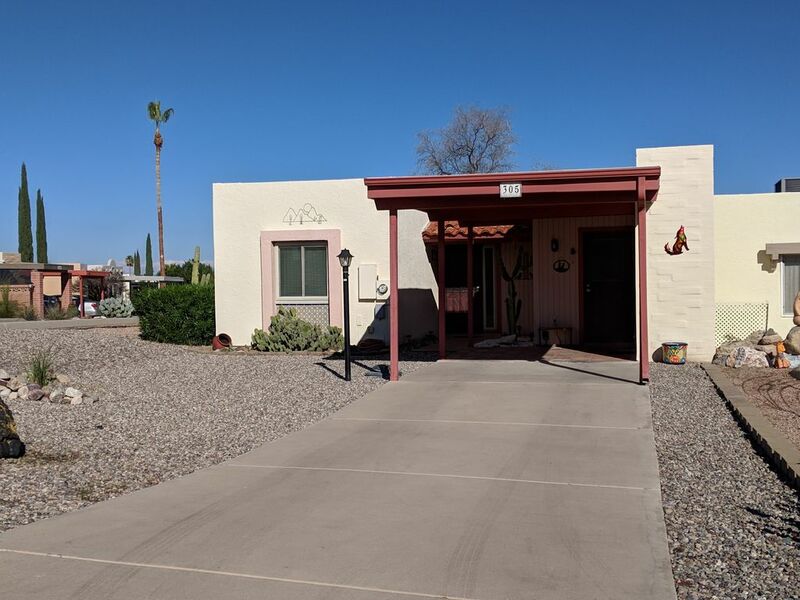 We had a wonderful 3 month stay in this lovely home in the friendly area of Casa Paloma II. The place was clean and ready when we arrived and it is very close to all the amenities. We were pleased to have them & are looking forward to having them return next year. We only had a week to spend in Green Valley and were thrilled to find this gem. It was furnished with absolutely everything we needed. It was clean, comfortable and close to everything . We will hopefully be able to rent this whenever we’re back in Green Valley. This nice unit was a central location Green Valley. We were close to the restaurants, grocery stores and main roads. It is a spacious unit with 2 beds and 2 baths, a nice patio and washer/dryer. Also important to us was the covered parking right outside the front door. The owner was extremely helpful and ensured that we were able to rent on a short notice. She also answered all our questions about the Green Valley since this was our first visit there. We would definitely stay here again! We found this townhouse to be quite comfortable, clean and well furnished. The owners were wonderful to work with and loved the neighborhood. We stayed in this wonderful condo for January, February and March. The well stocked kitchen is a big plus for me and we enjoy the central location far enough from the highway to be nice and quiet. The bedrooms are equipped with beds that are very comfortable. We found the condo to be very clean and the landlords always ready to go the extra mile to help us out. Will gladly return another year. We enjoyed our stay in this townhouse. It was clean, comfortable and well furnished. The appliances were like new and there was a good supply of cooking utensils. The owners were very helpful in every way. We certainly would recommend this townhouse.